Homeowners in Fairbault, Cannon Falls and other neighboring areas are seeing an early start to the spring storm season after hail damages homes during the storm on May 16, 2017. 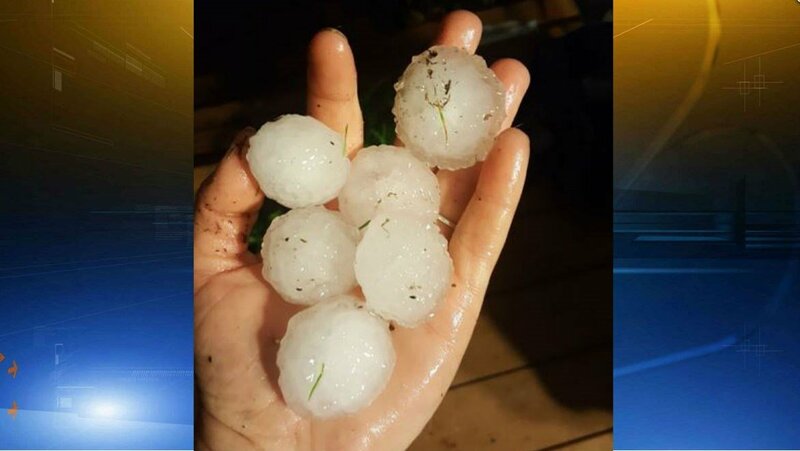 According to the National Weather Service, the largest hail stone reported on May 16, 2017 was 1.5” in diameter – yet photos from social media users and local news stations show hail was much larger in some areas. How Large Does Hail Have To Be To Cause Damage? After a storm, many people assume that if they don’t see missing shingles or visible hail damage, then their roof did not sustain any storm damage. That is not the case! Often, damage from hail cannot be seen from the ground level of a home and it takes a trained professional to spot it. Did you know that falling hail stones can reach speeds upwards of 100 MPH? Imagine the damage large hail can cause to your roof at that speed! Many factors play into how much damage a hail stone may cause including the size of the hail, density of the hail, wind speed, and direction. The age of your roofs shingles, the type of shingles and if your shingles are impact-resistant can all factor into the severity of your roof hail damage. Damage to your roof’s shingles can compromise the effective life of your roof and even if not immediately visible and may lead to large scale problems if not identified in a timely manner. That’s why it is so important to schedule a roof inspection after each storm, regardless of the hail size. The average hailstorm lasts only five minutes, but the hail damage does to property totals about $1 billion a year, according to the National Weather Service. When hail hits, it can damage the roof or covering of your home as well as other personal property, which is why it’s important to schedule a professional roof inspection after each storm to assess any damage! Generally, hail damage on a roof can be seen as indentations and/or fractures on the shingle’s surface but can be difficult to see from the ground. Hailstones vary in size, shape, and hardness and can create a random pattern of dents or depressions. If this is not evident, look for indentations on metal flashings, siding, chimney caps, or even skylight flashings. After some time, clusters of granules may come off (at the point of impact) in a random pattern and expose the asphalt. Because unrepaired hail damage to your roof will get worse over time, getting an inspection and repairing the damage is always the best idea and will help you avoid costly repairs. How Soon After A Storm Should You Get An Inspection? After a hail storm, check the exterior of your home for any obvious signs of damage including dents or cracks in your gutters. Should you see signs of damage, call for a professional inspection right away. Spotting hail damage on roof shingles is much more difficult. In most cases, hail damage can be impossible to see from the ground level of your home. However, we DO NOT recommend inspecting your own roof for damage. Falls from roofs account for 1/3 of all construction related fatalities. The safest and easiest option for you as a homeowner is to schedule an inspection with a professional roofing company, like Millersberg Construction. Think You Might Have Roof Damage? Unpredictable storms create unpredictable problems. That’s why it’s important to choose the right professional to inspect the integrity of your home after a storm. It’s important to find someone who is local, properly certified, efficient, courteous, and available to complete your warranty work. All of which you’ll find working with Millersberg Construction. Contact us today at 507-301-3626 or use our online form to request a free, no-obligation inspection! After a long, cold blistering winter it is so nice to finally feel the warmth of the sun. Bird are starting to chirp, grass is beginning to turn green, and families are starting to head outside. Spring is when everyone starts getting outside to freshen up their yard; planting flowers, raking left over leaves, getting new mulch, and digging out their patio furniture. This is the time of year that most people love. The sun beats down and we all soak up the rays as we haven’t been able to feel their warmth in months. Not only is this a pleasant time of year, it also can bring on some nasty storms. With the mix of the high and low pressures, dew and humidity points all over the place, it puts us all at risk for severe weather. Hail and high winds can damage our homes; damage all of the hard work we put into them. Hail can be very damaging but it is not always visible from the ground. As hail hits the shingles, it can cause granules to come loose and also bruise the bottoms layers of matting. This damages the integrity of the shingles and may cause leaks later on. Did you know that insurance companies will help pay to replace your roof if it has enough hail damage? As a local roofer and general contractor, we know what hail damage looks like and know the longer effects it can have on your home. Let us help make sure you get the help you deserve. Last night we had the first storms of the year; Dodge, Olmsted, and Wabasha Counties were the hardest hit. Byron, Blooming Prairie, Dodge Center, and Plainview were a few cities that received 2” hail. These storms may not have seemed very strong but they brought along with them hail that caused serious damage and needs a local contractor to come in and repair the damage. Left unrepaired, leaks will likely pop up in coming years. Spring is a great time of year but also when we need to be constantly sky aware. Get someone in your corner so when high winds come through or hail strikes, you have someone to help bring your home to pre-storm condition. Protect your home so it can continue to protect you and your family for years to come. Hanging lights is one way to get in the holiday spirit! It can be a dangerous job, and if not done properly, your home won’t have the holiday “glow”. Take the proper precautions and let your home be the brightest on the block. 1. Use a sturdy ladder. The last you need is to end up in the emergency room. Secure the ladder and have all your lights untangled before climbing the ladder. 2. Use a proper outlet. Safety first! Your source of power should come from a ground fault circuit interrupter (GFCI) outlet. This type of outlet will shut the circuit down if there is overcurrent. We want your house to glow, not sparks to fly! 3. Watch out for extension cords. Keep all extension cords out of the way. Also, we sure that they are rated for outdoor use. Avoid creating walking hazards. 4. Waterproof lights. Not only do you want them waterproof, you want to ensure that you purchase outdoor lights. Never use indoor lights for outdoor use. Extra tip: If you want even more lights, use net lighting. No more trying to weave strands of lights through branch, the net lights gives a full light look and it super easy. The cold has finally come upon us. The snow is surely soon to follow which means we are in the time of year that we have to start looking for ice dams on our roofs. Ice dams are thick ridges of solid ice that build up on the bottoms of the roof (the eaves). These can cause huge problems including damage to gutters, loosen shingles, and can cause water to back up and come into your home. There is a complex interaction of variables that allow ice dams to form. However, there are a few things you can do to prevent ice dams on your home. 1)	Ensure that the attic is ventilate property. This will keep the underside of the roof to keep a cool temperature, preventing any ice/snow melting on the outside. 2)	Cap that hatch. Seal any attic hatches to prevent the warm air from entering the attic. 3)	Exhaust to the outside. Ensure that all the ducts connected to the kitchen, bathroom, and dryer vents lead outdoors through the walls or roof, but never through the soffit. 4)	Add insulation. More insulation on the attic floor keeps the heat where it belongs, not in the attic. These are just a few ways that you can prevent ice dams on your roof. Millersberg Construction hopes that you never have to face the complications from ice dams. However, we have the experience and knowledge to make any required repairs from ice dams. At Millersberg Construction, we often hear the question, “Can you roof over existing shingles?” When people ask this, there are normally two motivating factors. One is likely their roofing budget and the other may be that the homeowner is cautious and is concerned the project will take a long time. However, it is against code in Minnesota to cover over existing shingles. When time and money are a concern, Millersberg Construction makes roofing easy on a customer and will take them step by step through the project. We provide a free inspection and can help you figure out the right shingles for your budget. As far as savings, you’ll love this: GAF offers you many great Lifetime Shingle choices, including Timberline® Shingles with Advanced Protection® Shingle Technology. They’re the #1-selling shingles in North America! Plus, we have: Roof deck protection, leak barriers and cobra attic ventilation. We understand homeowners concerns when replacing their roof. However, Millersberg Construction brings the expertise and know-how to make the job a breeze. Our business is built upon an excellent customer experience and the satisfaction of knowing that the job is done right for you. We’ll work on every building as if it were our own. 1. Make sure all drainage areas are unblocked by leaves and debris. Plus, make sure your gutters are clear of leaves and debris. 2. Check your attic to make sure that the vapor barrier of your insulation is facing downward. This will trap moisture and stop possible water problems. 3. Trim dead branches off trees to prevent them from breaking off with a build-up of ice or being blown down during a winter storm. Too often, dead branches can land on your roof and could potentially damage your roof or shingles. 4. Schedule an appointment with Millersberg Construction for a roof inspection. If the shingles are curling, buckling or crackling, you will need to replace them. Millersberg can check the roof plus the flashing around pipes and chimneys. With snow and ice on the horizon, you don’t want any gaps or ice will find its way in that space. Just a few maintenance tips can help you prepare your home for the upcoming Minnesota weather. If you have any questions, please contact Millersberg Construction in Dundas, MN. Sometimes the scariest thing is not knowing, and for homeowners who’ve sprung a leak, are the photos and pictures that are lost when they are water damaged. Depending on the size and location, you may not have to get a new roof. However, you do need to get it inspected to see where the leak is coming from and how much damage there may be that cannot be seen. Contact us for a free inspection at Millersberg Construction. Ah, the question every roofer hears at some point. Unfortunately,(the Better Business Bureau reports that a shocking 73 percent of homeowners feel home repair and improvement contractors can’t be trusted). Finding someone you can trust is pivotal. Millersberg Construction prides ourselves on being one of the best construction companies to work with in Minnesota. Our certifications stand behind that. We make the experience focused on you from beginning to end. That’s why we don’t ask for any money upfront, have the best warranties available, and use top-of-the-line materials to ensure the best solution for your home. You may seriously damage their roof. At their most innocuous, improperly nailed roofs can result in ripples, lifted shingles, and leaks. On the more serious side, there is potential for roof collapse and even bodily harm. As a DIYer, you may have replaced a few shingles here and there, but roof work requires a pro. Local jurisdiction may forbid you from doing roofing work on your home and certainly without a license. You may void a manufacturer’s warranty. Improper installations result in so many roofing replacements that manufacturers often won’t cover a roof that isn’t installed by a licensed contractor. So, when you are ready to roof, contact Millersberg Construction. We are here to help! This Minnesota military roofing rebate is a way to say thank you to all the military families and people who give each day for our country. GAF Roof for Troops program is available through December 31, 2016. Active U.S. military, veterans, and retirees receive a $250 rebate on a GAF Lifetime Roofing System* that includes GAF Lifetime shingles and at least 3 qualifying GAF accessories when installed by a GAF Master Elite™ or Certified Contractor between January 1, 2016 and December 31, 2016. (After purchase & mail-in rebate) Learn More Here. We want to make the rebate on roofing easy for military families. At the end of the project, we’ll give you the paperwork you will need to submit your rebate. Because we are GAF certified, you know that by working with Millersberg Construction, you are getting the experience you deserve. We can help you pick the right roofing option and get the job done. If you want to get more involved or learn how to help our Minnesota troops, check out the Minnesota National Guard website or the Minnesota Military Family Foundation or Beyond the Yellow Ribbon. These are just a few of the organizations that we know of who help military families in Minnesota.